With the main cast firmed up, Paramount Pictures has given Hot Tub Time Machine 2 a December 25, 2014 release date. The comedy sequel will be going up against the Disney musical Into the Woods and Universal's true story adaptation Unbroken, directed by Angelina Jolie. 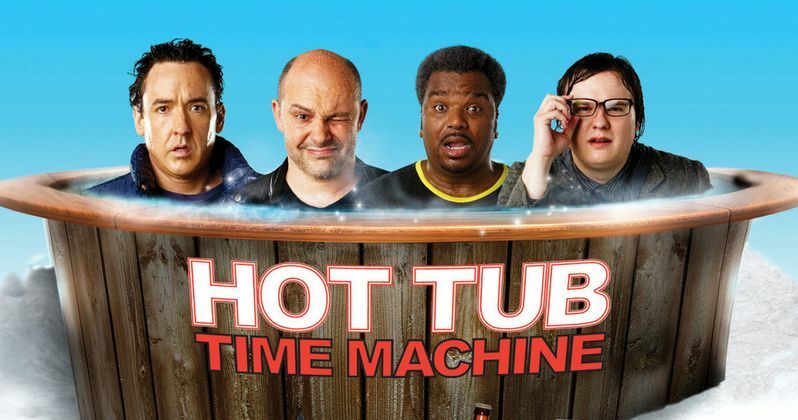 Hot Tub Time Machine stars Craig Robinson, Rob Corddry, Clark Duke and Chevy Chase are reprising their roles in the sequel, with Adam Scott playing the son of John Cusack's character. We reported in August that the story is set 10 years after the original. That report also revealed that Rob Corddry's character Lou is now a billionaire, after using the time machine to change Google to Lougle. The story centers on Nick (Craig Robinson) and Jacob (Clark Duke) who use the time machine to try and get back to the past after Lou gets in trouble, but they inadvertently end up in the future, which they must alter if they want to save their present-day environment. Steve Pink is directing the sequel from a screenplay by Josh Heald. It isn't known when production will begin, but with a release date set for late this year, shooting should begin fairly soon.